Enjoy our spacious Tap Room for your next Private Party, Cooperate Event, Wedding, or even just reserve a table for your group during normal hours! .Our private event space can comfortably seat 68 people (capacity 91) with plenty of room to roam. We believe that meeting the brewer is an important part of going to a brewery. We try to make sure that at least one of the brewers is available to give a tour and meet your guests. Fill out the form on this page and we will get back to you within 24 hours to begin working on reserving your event! Please see our FAQ for our guidelines regarding children in the tap room. We do not recommend our space for your child’s birthday celebration, please remember this is an establishment where adults gather to consume alcohol. Thank you for your interest in booking an event at Widowmaker Brewing! Option 1 - No reservation minimum - We do not reserve any tables for you and your group. When you arrive you and your group would set up in the open area that works best. This is an option, it has worked for some groups as they arrived at a time where a table or 2 was open and they made it work for them. With larger groups I would not suggest this option. Option 2 - Group Minimum - We do this option with most groups we host and reserve space for. We would set a minimum spent per person based on the night, we always set the minimum at $20 per person. This does not mean that each person needs to spend $20, it just means that if you have a group of say 25 people your minimum would be $500. With this option you have tables reserved for you but you also have a free roam of the space to utilize the tap room games, check out the brewery, ect. We do this option all the time and it really seems to be the best option for most parties. We do not require a deposit, we will send an agreement when the party is confirmed which states the host of the party is aware if the minimum is not reached the host will be charged the difference (i.e. a host books a party of 10 and they have a $200 minimum but only spend $150 dollars we will in turn charge a $50 reservation fee). Option 3 - Rent the whole space - Again we would do a minimum per person with the same expectations. 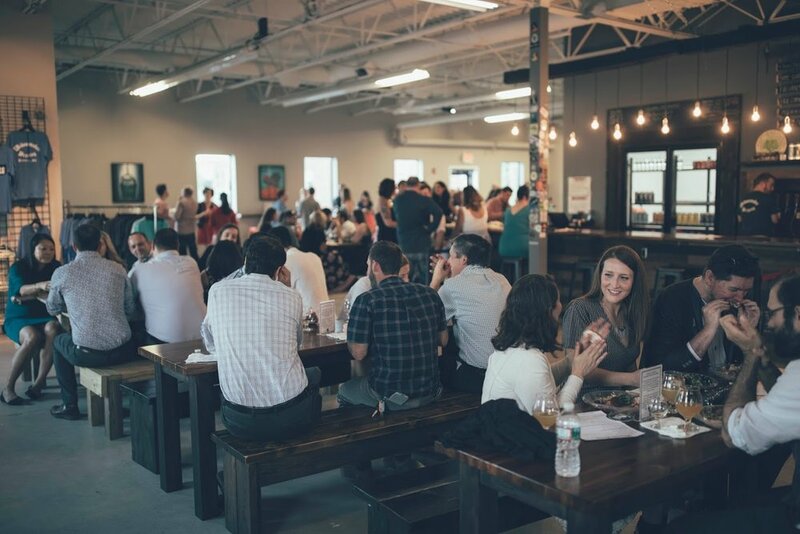 Depending on the day and the amount of time you would like to book the room we would come to an agreeable room fee in order to have a private event that closes our tap room to the public. We have a capacity of 91. FYI- Widowmaker Brewing is a Brewery. By law, we can not have any other Alcohol in our facility. Beer from our Taps is what we are allowed to provide to the public. This place is the best, and it’s run by awesome people. My husband and I threw a party here to celebrate eloping, and working with Derek the taproom manager was such a pleasure. Planning was easy and fun, and they were super flexible with everything. The party itself was amazing, it was exactly how we had pictured it. Our friends and family loved having the space to mingle and play games. We had the party catered and they helped us set everything up and there was plenty of space for everyone to eat. The staff was so friendly and attentive, I saw lots of our guests buying beers to take home at the end of the night too! We actually ended up extending our time by an hour because everyone was having such a good time at the end of the night no one wanted to leave!